Bus Loading: Bandimere Speedway. Marathon 3:30am to 4:15am. Half Marathon 4:15am to 5:15am. Expo: Saturday, June 1, 2019 from 10:00am to 6:00pm at the Steinhauer Field House on 13th and Maple Street on the School of Mines campus in Golden, CO. In addition to offering a fully-supported run down an incredibly beautiful Rocky Mountain canyon and getting the best PR opportunity you may ever have, we strive to make this event even more memorable with some additional perks, listed below. Medals are provided to all participants as you cross the finish line. Our race medals are not your run-of-the-mill awards. We award huge, high-quality medals that are equal to your effort. These are certain to win a place at the top of your medal collection. See samples of the medal from various years below. Every participant will receive a high-quality, gender-specific race shirt. We guarantee that this will be a shirt you'll want to keep and maybe purchase an extra or two. During registration you can select between a long sleeve, short sleeve shirt, or tank. Select the size of shirt you want, but don't sweat it if you're not sure about sizing. You can try it on at the expo, and if it doesn't fit you can exchange it for a better size while supplies last. We don't want you to be stuck with a shirt that doesn't fit! REVEL Rockies swag and sponsor swag will be available for pick-up at the expo. In addition to other items, all runners will receive a pair of throw-away gloves and a mylar blanket to be used in case of cold weather. Iced towels will be given to all runners as they cross the finish line. Once you cross the finish line, stick around and enjoy the exciting atmosphere at the finish. Runners will be greeted with some great food as you celebrate your achievement with friends and family. Check out the vendor booths, get a photo in front of our beautiful backdrops, enjoy an ice cold beer (beer garden is 21+, you must have a photo ID to enter), give a hand to the rest of the runners coming in, and attend the awards ceremonies to congratulate the winners. 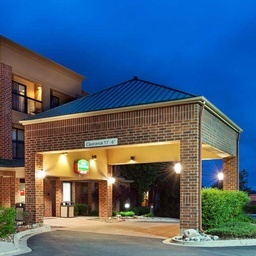 We understand that things come up, which is why we try to be as flexible and accommodating as possible. We allow runners to transfer between distances (half to full or full to half), transfer their entry to another individual, defer to another event, defer to next year and even withdraw from the race if their plans change. Please see our withdrawal, transfer, & deferral page for more details. 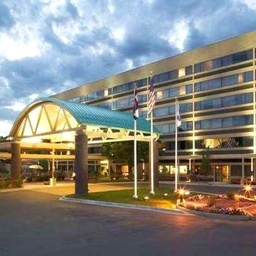 If you are traveling to REVEL Rockies, the closest airport is the Denver International Airport. 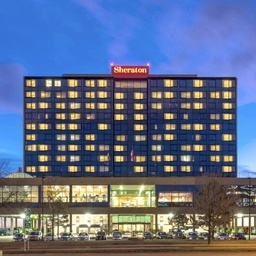 The finish line is about 40 miles from the airport and even closer to downtown Denver. The REVEL Rockies Expo will be held on Saturday, June 1, 2019 from 10:00am to 6:00pm at the Steinhauer Field House. 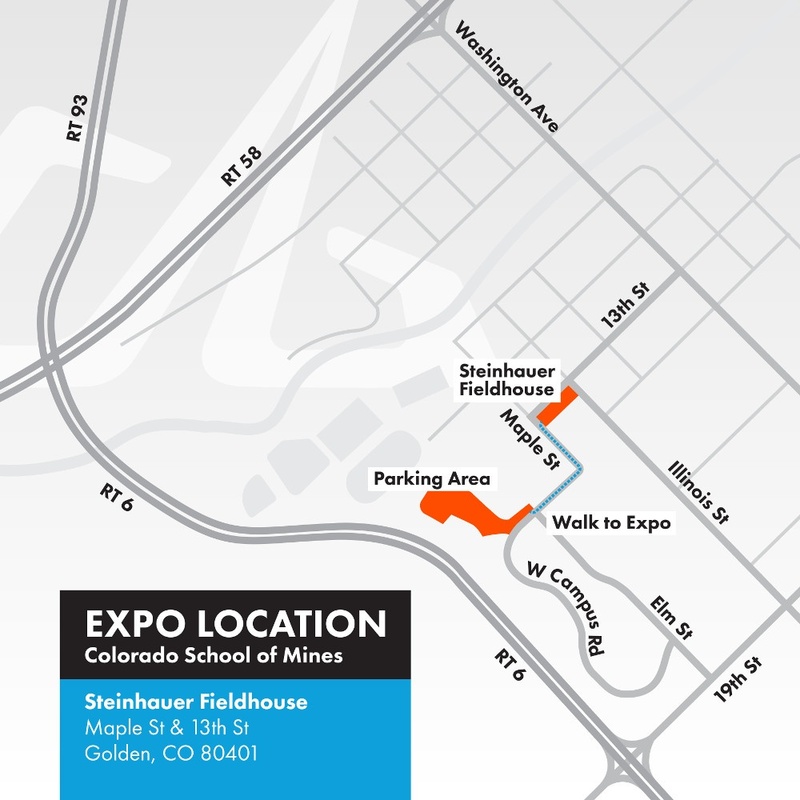 The expo center is located roughly 7 miles from the finish venue at 13th and Maple Street on the School of Mines campus in Golden, CO.
A photo ID is required to pick up your race bag. We will allow individuals to pick up someone else's bag, but will require a digital or hardcopy of the person's ID and a note authorizing them to do so. If you will be arriving in town after the expo is closed or are otherwise unable to attend the expo, you may elect to pick up your packet and bag on race morning for an additional fee. This option may be selected during registration. Race parking is available in the Island Lot which is located directly across from Bandimere Speedway (3051 S Rooney Road, Morrison, CO 80465). Please take the Morrison Road (Highway 8) Exit off of C-470. All parking is free. All buses will depart from the Island Lot. Marathon buses will load from 3:30 to 4:15 AM and half marathon buses will load from 4:15 to 5:15 AM. Please make sure that you are on time and that you get on the right bus! Staff will be on hand to help direct runners and ensure that parking and busing runs smoothly. Spectators may also park at the same locations as runners, though parking spaces may be limited. If the lot is full, overflow lots will be available at Bandimere Speedway. 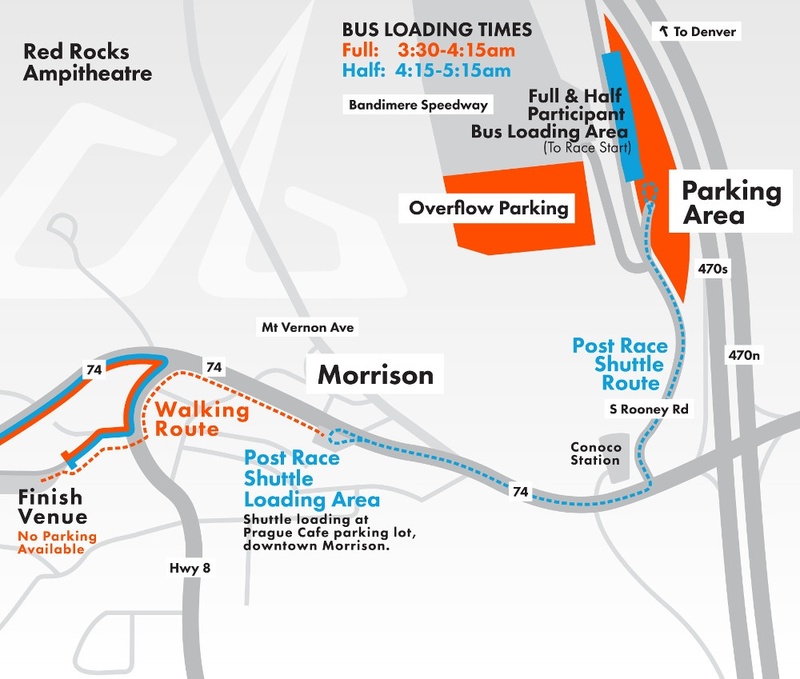 From approximately 6:00 AM to 12:30 PM there will be a continuous shuttle between downtown Morrison and Bandimere Speedway, where spectators can take the bus to the finish line. This will also be the same shuttle finishers and spectators can take back to their vehicles. The half marathon begins near the intersection of Lewis Ridge and Evergreen Parkway in Evergreen. Participants will stage in the Evergreen Dental Group parking lot. The full marathon begins roughly 11 miles up Squaw Pass Road. Participants will stage in a pullout area at Echo Mountain. Porta-potties, water, Powerade, coffee, basic first aid items, and last-minute instructions will be provided at the starting areas. While we will provide gloves and mylar blankets, we highly recommend you come prepared for cold temperatures at the start line by layering and then shedding your layers to put in your drop bag just before the race begins. The finish line is located in the beautiful town of Morrison. The finisher's area will be packed with food, massages, refreshing beer (beer garden is 21+, you must have a photo ID to enter), vendor booths, and more. 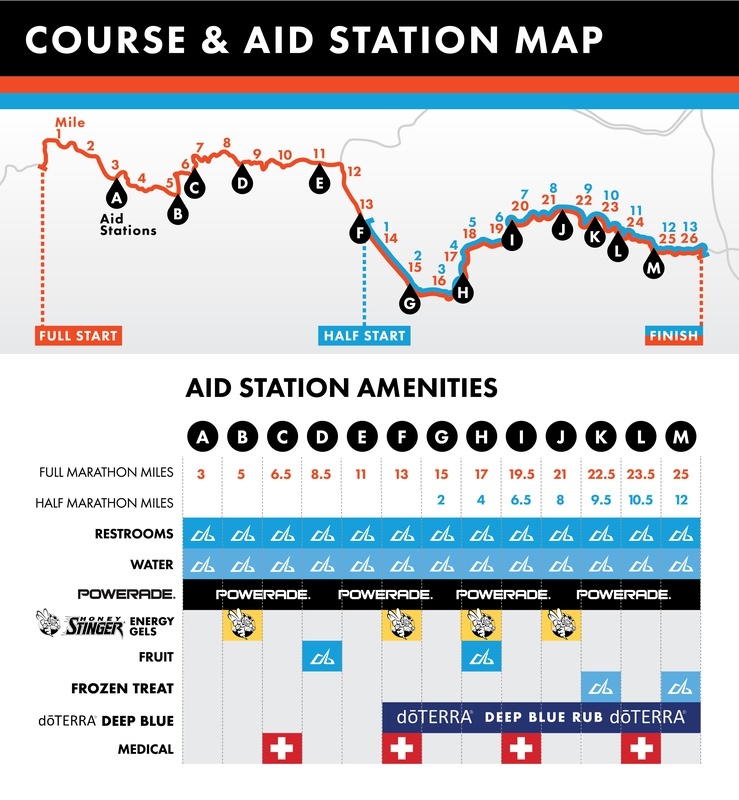 The map below shows the layout of the finish venue and indicates the locations of all the areas listed above as well as the designated areas for bag pickup, results, porta-potties, team tent space, and so forth. 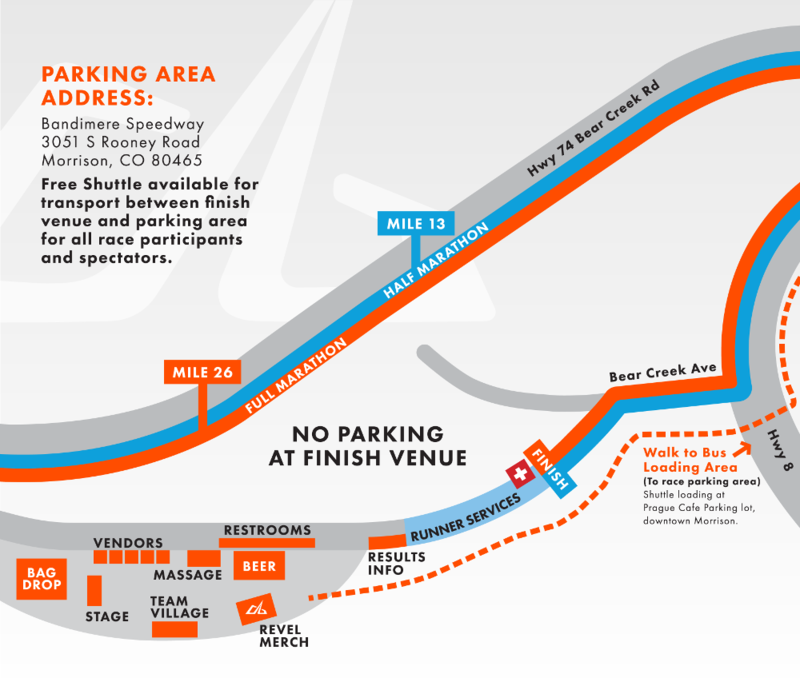 From approximately 6:00 AM to 12:30 PM there will be a continuous shuttle between downtown Morrison and Bandimere Speedway, where spectators can take the bus to the finish line. This will also be the same shuttle finishers and spectators can take back to their vehicles. The road will be partially closed to traffic during the race. A diagram with adjusted traffic patterns and details is forthcoming. In addition to the first-aid kits, various aid stations will be staffed by medical volunteers and equipped with a medical tent. 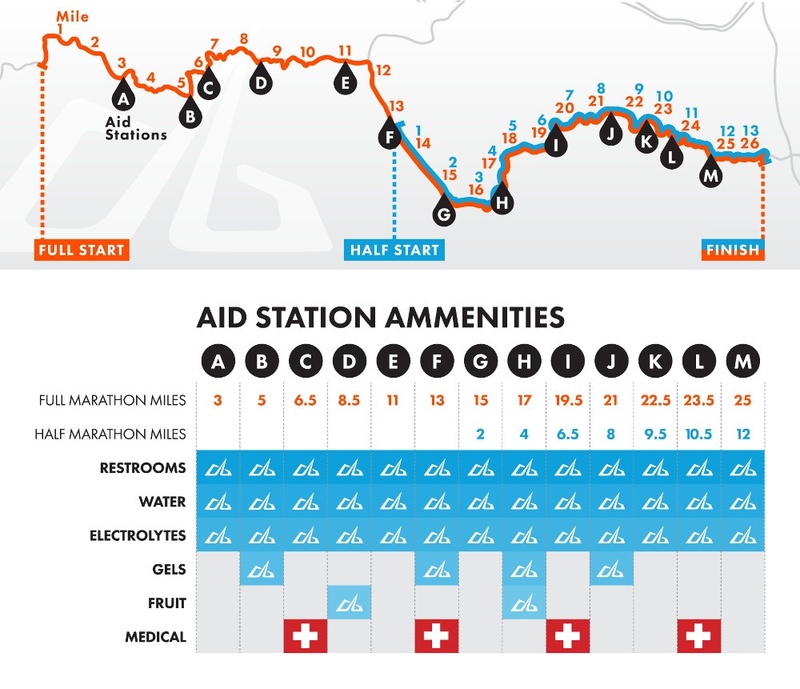 See the Aid Stations section for more details. Because the roads used for the race must be re-opened for normal traffic patterns, we are required to set course time limits that must be strictly adhered to. The course time limit for the full marathon is based on a 13:00 minute per mile pace, which is a light jog. This equates to roughly a 5:40:00 marathon. The time limit for the half marathon is based on a 23:40 minute per mile pace, which is a leisurely walking pace. This equates to roughly a 5:10:00 half marathon. Those who are unable to maintain the required pace must consent to be picked up by a sag vehicle. Runners may not be immediately transported to the finish venue, sag vehicles will leave periodically depending on location. Once at the finish line they will still be allowed to cross the finish line and receive a medal. Please remember that these are average temperatures for Evergreen, CO (where the race begins), and that temperatures may be considerably cooler in the morning. While we will provide gloves and mylar blankets, we highly recommend that you come prepared for cold temperatures at the start line by layering and then shedding your layers to put in your drop bag just before the race begins. Spectators will not be allowed on Squaw Pass Road (Highway 103) or Highway 74 between Evergreen and Morrison due to the unique traffic control plans that will be in place for the event. Spectators are encouraged to gather at the finish venue to support their runners. Alternatively, spectators can choose support their runners along the Evergreen Parkway portion of the race. Because of closures, the best way to enter and exit the Evergreen area is by using Interstate 70, thus avoiding HWY 74 between Evergreen and Morrison. Runners will be using the easternmost lane of northbound Evergreen Parkway and there are multiple parking areas available along this portion of the route. Please also note that the course runs along Meadow Drive between Evergreen Parkway and HWY 74, thus avoiding the downtown Evergreen strip. All runners completing the race will receive one of our famous finisher's medals as they cross the finish line. Age division awards will be given as well and can be redeemed at the Results tent. Additional awards will be given to the top 3 overall finishers in each race and redeemed at the Results Tents.